Anuradhapura is located in the North-Central part of the island. It was the first capital and undoubtedly the grandest city of ancient Sri Lanka. It is the home of two World Heritage sites. Many places of historical and archaeological interest could be visited. Ruwanweliseya (2nd century B.C.) is the most famous of all the ‘Dagoba’s in Sri Lanka. ‘Samadhi’ Buddha (3rd century B.C.) is one of the most famous statues, depicting the Buddha in a state of ‘Samadhi’ or deep meditation. Isurumuniya Rock Temple (3rd century B.C.) is well known for its rock carvings. The 5th century Sigiriya Rock Fortress is a World Heritage site, built by King Kasyapa (473-491AD). Also known as the ‘Lion Rock’, it is a site of unusual beauty rising 200 meters from the jungle. The rock was the innermost stronghold of the 70 hectare fortified town. A moat, rampart, and extensive gardens including the renowned water gardens ring the base of the rock. View the world-renowned frescoes which are in a sheltered pocket of the rock that could be approached by a spiral stairway. Colombo, like many capital cities in developing countries, is fast changing its face. Skyscrapers arise from where old buildings once stood. Yet in some parts, the old world charm is retained. Places of interest are the Pettah Bazaar, the old parliament in Fort, Hindu and Buddhist Temples and residential areas where you find the stately homes of the affluent. Lavishly spacious old-world Sri Lanka architecture evokes an aura of ease and relaxation inviting you to this humble city of lush coconut palms and fragrant frangipani. Its golden tropical beach lies just 2 ¼ hours from the Colombo Airport. The Bentota Ganga curves to the south before turning to flow northward into the Indian Ocean where river and sea form a narrow spit of land. The wide Bentota River and its lagoon-like hinterland are ideal for boat trips. The Bentota Art Center introduces tourists to the intricacies of local handicrafts. Yala is the largest national park in Sri Lanka and is the home of wild elephants, wild boar, buffalo, leopard, bear, deer and crocodiles. You can also see large flocks of migratory and indigenous birds. Nuwara Eliya, because of its invigorating mountain climate and scenery, is Sri Lanka’s most popular hill resort. The city is also the centre of Sri Lanka’s hill country, producing a significant share of the world’s finest tea. Nuwara Eliya also has one of the finest 18 hole golf courses in South Asia. 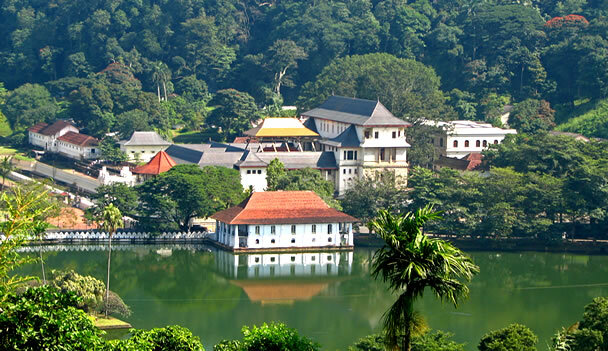 Kandy was the last capital reigned by kings of Sri Lanka and is a World Heritage site. The name Kandy conjures visions of splendour and magnificence. Many of the legends, traditions and folklore are still lovingly kept alive. Visit the Kandy town and the Bazaar, the Arts & Crafts Centre, the Gem Museum & Lapidary. You may thereafter visit the Temple of the Tooth Relic. Polonnaruwa, which was the 2nd capital of Sri Lanka, was built in the 11th and 12th centuries AD, and is a World Heritage site. Here you can see the ruins of the Royal Palace and the Gal Viharaya, where three splendid statues of the Buddha in ‘Upright’, ‘Sedentary’ and ‘Recumbent’ postures are carved out of rock. Trincomalee is a tropical city on the east coast of Sri Lanka. With one of the finest harbors in the world, Trinco enjoys warm weather all year round and beautiful beaches. It also hosts a famous Hindu temple, as well as great hotels. Situated in the Hill capital Kandy. This visit to this garden will provide spectacles at extraordinary beauty and absorbing interest for any nature lover and casual visitor.Peradeniya garden gives you a first hand introduction to the trees and plants used for the traditional Ayurvedic medicine. Mahaweli river, Sri Lanka’s longest river surrounding this garden gives an added beauty to this garden. Uda Walawe, in Sri Lanka’s south-central sector, is the area which most resembles an African game park. Wildlife reports say there are about 500 elephants in the park and they often roam in herds of up to 100. Leopards, buffalo, deer and sloth bears keep them company along with mongooses, bandicoots, foxes, water monitor lizards and crocodiles. A half-day tour is the best way to see the 30,821 hectares of protected area parked on the Uda Walawe Reservoir. The Horton Plains National Park is the only National Park situated in the Hill Country and falls within the Nuwara Eliya district and is 200 km away from Colombo. Panoramic scenic beauty of the Hill Country could be witnessed within the Park. The famous `Worlds End’ is a major attraction within the Park. Hikkaduwa is a very popular beach destination just a few hours from Colombo on the southwestern coast of Sri Lanka. Tourists can enjoy days relaxing at the beach and dining on delicious Sri Lankan and western food. Fresh fish is the specialty. Glass bottom boats offer fantastic views of coral reefs just off shore. For thoses interested in diving, complete diving facilities are available. Especially for families Bentota is a well sought after destination. Safe swimming conditions combined with fun water sport and exciting excursions are providing for the ideal background for a relaxed holiday in Sri Lanka. Kalkudah / Passekudah beach is another famous fantastic beach on the eastern coast of Sri Lanka. This place is ideal for sea bathing. Also this beach is ideal stretch for windsurfing, sun bathing and water skilling. The Kalkudah reef system was proposed as a Marine Sanctuary. Arugam Bay is listed as one of the top ten surf points in the world. Situated on the southeast of Sri Lanka , Arugam Bay receives the same Antarctic winter swells that hit Indonesia ‘s southern shores in the middle of the year. The best time of the year for surf is between May and November when the predominant wind is offshore for at least the first half of the day. Being set about halfway along the Hatton of Central Highlands of Sri Lanka to Avissawella of low lands of Sri Lanka, Kitulgala is surrounded by wooded hills making way to the swift waters of River Kelani Ganga. Surrounded by low wooded hills, Kitulgala is a village of lush vegetation. Many birders stay at Kitulgala. Just across the Kelani River is a primeval forest with lush tropical flora, home to about 54 rare species of birds. Though in a lesser density, most of the rain forest bird species that are found at the Sinharaja rainforest can be sighted at Kitulgala. Elusive endemic species like Sri Lanka Spurfowl, Green-billed coucal and Spot-winged Thrush too are seen in the woods. The hills above the rubber plantations are populated with Mountain Hawk Eagle, Crested Treeswift and Layard’s Parakeet.